Words and pictures by D. Martin Myatt. With Force Friday behind us, the shroud of silence on all things related to the Force Awakens has been (partially) lifted making New York Comic Con the only event licensees would be able to publicly reveal products based on the first post-Lucas Star Wars feature film before its December 18, 2015 premiere. With a short break between other projects there was a 24 hour window to be in New York City allowing us to visit Hasbro's annual party and spend (literally) a couple hours photographing everything we could find on the first day of the 2015 New York Comic Con. We arrived at the Jacob Javits Center just before the doors opened and hit every booth we could find before heading back to the airport. Below is the complete rundown of what we saw. Hasbro held to tradition and hosted their 'Twas The Night Before... Party the night before the doors opened for the New York Comic Con. The invitation-only catered event was held in a large gallery space in Midtown Manhattan, and attendees were presented with an opportunity to speak with the brand managers and to see firsthand many upcoming products. There were quite a few new Star Wars products on display, but none more exciting than The Black Series 6-inch figures including General Hux, Captain Phasma, Ello Asty, the Resistance Trooper, the First Order TIE Pilot, and old man Han Solo revealed that night. The Black Series wasn't the only line to have product displayed at Hasbro's 'Twas The Night Before... Party. Follow this link to check out a gallery showing everything else they had on display at the event including many new Galactic Hero Jedi Force, Mashers, Titan, and Titanium products! Beast Kingdom's cool Star Wars Egg Attack figures, including Darth Vader, Stormtrooper, Shadow Trooper, and Sandtrooper as well as their electronic Darth Vader statue, were on display in the Bluefin Distribution booth. Click the thumbnails above to check them out! Pardon Me For Asking, Sir, But what Good Are Snub Fighters Going To Be Agains That? 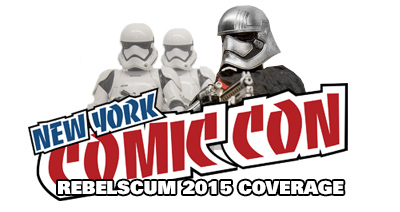 Offering their New York Comic Con exclusive Death Star "High Altitudes" Surface Modules No. 1 replica, the EFX Collectibles booth was a hive of activity. Follow the link above for a closer look at the exclusive and everything else they had on display. A familiar green glow illuminated the crowd in one section of the Jacob Javits Center where Funko has set up shop. Follow this link to see what they had on display! New The Force Awakens Collectibles At The Koto Booth! Kotobukiya put two new ARTFX+ pieces on display in their booth. Follow this link to check out the full gallery that includes the paint master for the Captain Phasma and the unpainted sculpts for the C-3PO & R2-D2 with BB-8 ARTFX+ model kits, both sets publicly displayed for the first time at this event. Do note, the Phasma had already evolved past the paint master before it was put out. Instead of a painted weathered grey / silver on this piece, the model kit will produced with a chrome finish and a slight paint revision on the helmet to make it more screen accurate. The first assortment in Metal Earth's The Force Awakens 3D Metal Model Kits assortment was displayed at their booth. Follow this link to have a closer look at their Kylo Ren's Command Shuttle, Poe Dameron's X-Wing Fighter, Special Forces TIE Fighter, and First Order Snowspeeder kits. The Sideshow Collectibles booth didn't have much Star Wars stuff on display, but all five items are great, especial Hot Toy's The Force Awakens First Order Stormtrooper and Heavy Gunner Stormtrooper, both of which were publicly displayed for the first time in North America at this event. Follow this ink to have a closer look at the gallery! Spin Master's booth at the New York Comic Con wasn't big, and it only had two toys on display, but they were two very cool toys. Follow the link to have a closer look. Movie Realization Ronin Boba Fett Revealed! The Movie Realization Ronin Boba Fett, which was announced and teased last July at the San Diego Comic-Con, was publicly displayed for the first time in North America in Tamashii Nations' booth. Follow this link to have a closer look at it and the rest of the Movie Realization line! Brand new in house and fan made licensed Star Wars shirts are being offered at the We Love Fine booth. Follow this link to check out all the new designs on display!